An easy recipe which gives great results! Blackcurrants are loaded with pectin so there shouldn’t be a setting problem. Wash the black currants and drain well. Put into a pan with the water and stew until soft and pulpy. Strain through a jelly bag and allow to drip for three or four hours. Add lb (450 g) warmed sugar per pint of juice obtained, stirring until the sugar has dissolved. Glad to hear that it turned out so good. 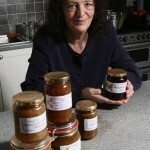 Will be putting a few more jelly recipes on soon. 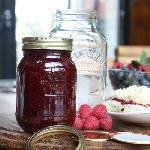 Wonderful recipe,full of flavour and so easy to make, will now try the redcurrant jelly recipe. Hi googled for recipe for the blackcurrant jelly. Ten pots today need labels. Great with the a.m croissants.Thanks. Made my first blackcurrent jelly yesterday. Easy recipe with great results! Thank you. Followed the recipe to the letter. Ended up with 10 pots of Ribena! Will reboil soon and keep you informed. 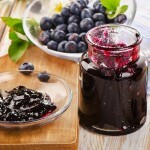 just made some jam, instead of black currants I made it with elderberrys, it was so easy to make and very good. 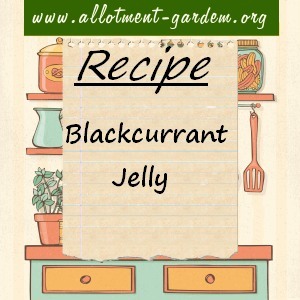 Just read your recipe on blackcurrant jelly. Still got some in the freezer from last year, will give the wife a nudge and see what she can do. just made my first jelly, lovely. Pat Hill. We use an upended high stool but other than that, your method is the one we’ve used for years. My “jelly bag” came from Lakeland many years ago. The frame folds flat in a box and I have bought replacement bags over the years. I believe they still sell them. If not — create a demand! I’m using your recipe and I love it and I find that if I don’t use enough sugar for the jam to set I get the most delicious tasting topping for vanilla ice cream!! Also I never seem to have a muslin bag to strain the liquid so I use a stocking!! Most efficacious and handy!! A new unused one!! The recipe is in pounds and ounces as well as metric. I only have around 800g of fruit. Will this work if I adjust the other amounts by the same proportions? I only had 1 lb of blackcurrants but decided to try this recipe. I ended up with 2 jars of jelly about 1 1/4lb. A really good simple recipe. It has been many years since I tried jam making because the last time was a failure – unable to get it to set. As I presently have bushes loaded with blackcurrants I thought I’d better have another go. 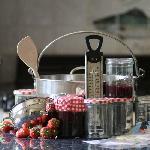 Result – 9 jars of blackcurrant sauce! Probably mostly my fault for being a lousy cook but also due to lack of and conflicting information. I looked up recipes on four sites. All of them said, of course, boil until setting point is reached. Two of them gave no indication of how long this might be; one of them said approx. 10 minutes; the other said approx. 1 minute. So I’m taking consolation from the fact that it is not all just my fault – apparently the experts can’t agree!! Picking fruit tomorrow for only the second time. Ate last years. Will follow your recipe, and advise outcome. J. Ban Ayrshire. Really good receipe. Made 5 1lb jars of very tasty jelly. Going to try it with jostaberries too – Will repost with outcome. Help. Easy recipe but how do you get it to set? It is very runny but smells lovely.